Once you get out of the South Exit at Koenji (JR Chuo or Sobu Line), go straight along the overpass and you’ll find the Pal shopping street. Don’t be tempted to go there! Keep walking straight, and you’ll find a building with an Irish Pub located on its first floor. Need some exercise? Well you can get one here, because you’ll need to climb up some stairs to get to the third floor. 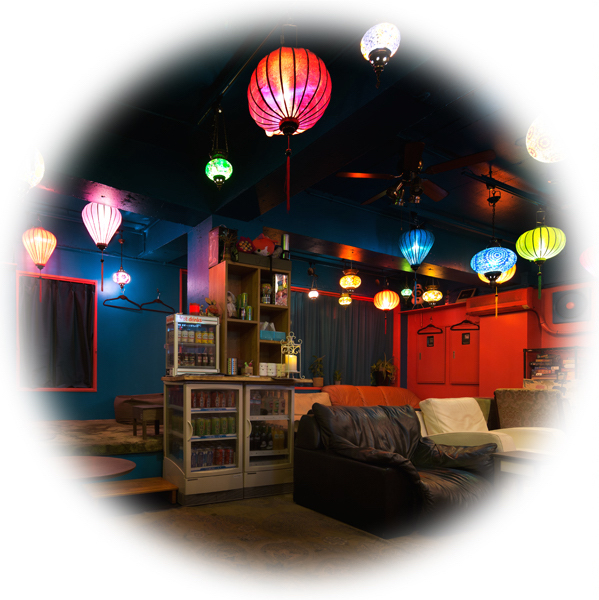 Then you’ll find shisha lounge 8g Koenji right before your eyes! Once you get off at Kichijoji (JR Chuo or Sobu Line), get out of the West Exit (or the Atre Exit). You’ll come across so many temptations — amazing bakeries, a bookstore, enticing variety stores — but continue walking straight. (You can take brief tours if you want.) Go down the stair at the end of Atre, and if you turn right you’ll immediately spot a giant UNIQO building. Cross the road (remember not to ignore the traffic light ;) ), and go straight down the Nakamichi street left to the UNIQLO building. Turn right at the first corner, and you’ll find an antique-ish cute green building with an import food store located on its first floor. In front of the building is Morimoto Hospital, if that would hep. 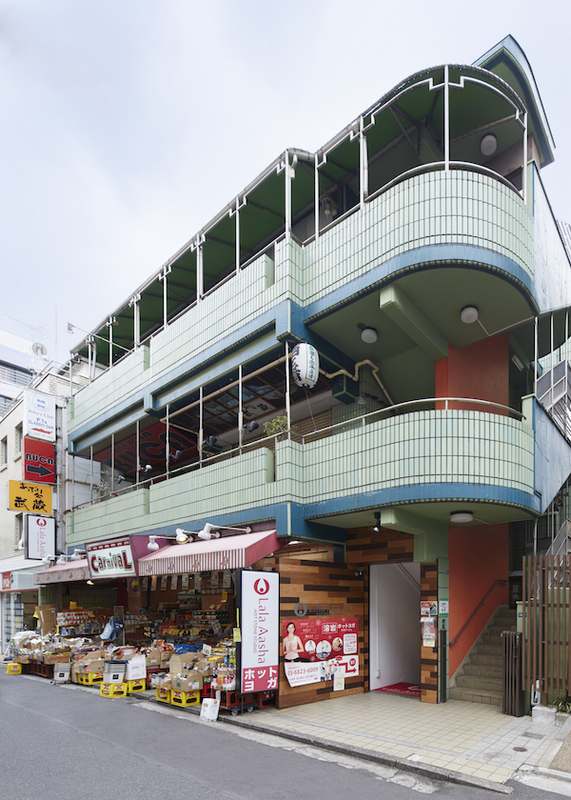 Go up that green building, and you’ll find us — you might think we’re a classy flower shop or a posh clothing store with all the dried flowers hanging from the ceiling, but that’s 8g Kichijoji! So don’t pull back! 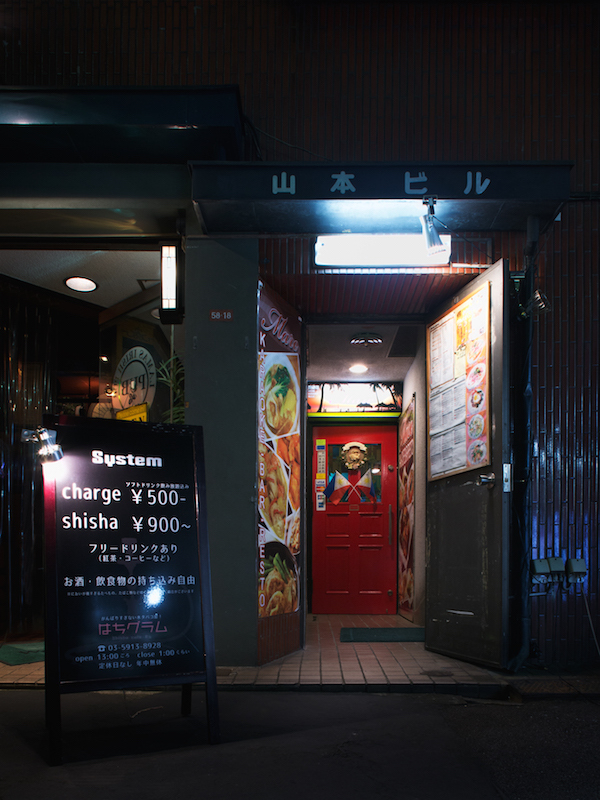 We are a shisha lounge located in Koenji and Kichijoji — towns that claim to be one of the coolest neighborhoods in Tokyo. Both stores provide an array of all-you-can-drink non-alcoholic drinks. Feel free to bring in any food/drinks/snacks of your own too! We also have free Wi-Fi, sockets and chargers you can use for free, too. Most of the seats are sofa seats — which makes our store utterly comfortable. Sometimes even too comfortable. 8g is perfect for any occasions — need a time out on your own? Looking for a relaxing place for your date? Want to have some fun with your friends? Got some work to do (alone or with others)? Come to 8g, and you’ll know why. We have English speaking staffs too! 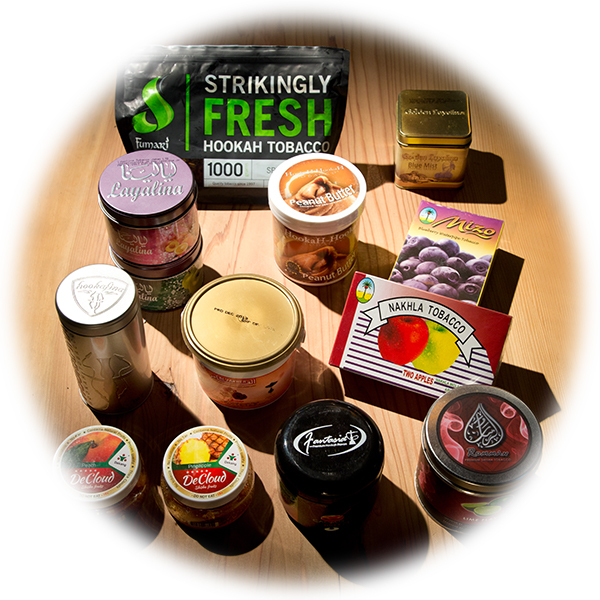 We have more than 190 flavors ready for you — sweets, drinks, flowers, spices and herbs, let alone the mainstream fruits flavors. You want to mix the flavors? Why not. Make an order like you would at a bar. Tell us what you feel like having or what you like, and we’ll be at your service. Never tried hookah before? No worries, we’ll make one for you to enjoy. You’re already a hookah lover? Then you’re at the right place to be. We’re always open for any suggestions and/or comments, so let us know if you do have any! We’ve got Phunnel Bowls, Egyptian Bowls, Turkish Bowls, Ferris Bowls, the 80Feet Bowls, Kaloud Lotus Bowls and many other accessories to spice up your hookah. When you make your order, let us know if there’s anything you’d like to try! Have no clue of any of the mentioned things? No problemo. We’ll use the perfect accessories/parts to make the best taste we can. N.B. 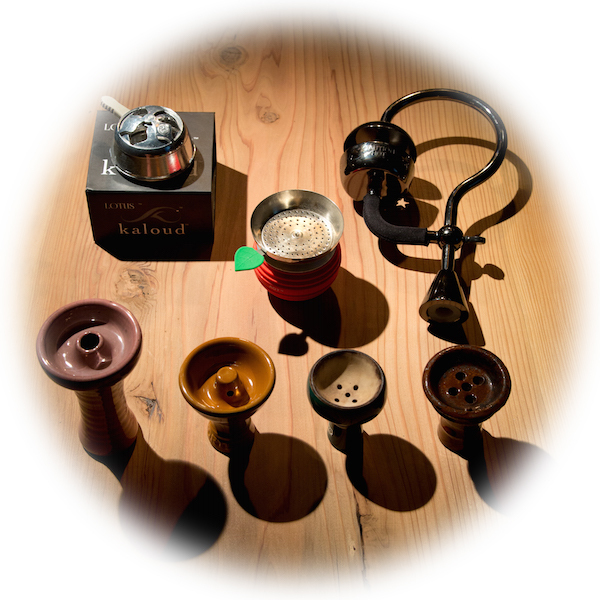 You may not be able to choose your hookah size depending on which accessories you’d be using. But don’t worry, we will let you know in such case. Of course, we’ll charge you no additional fee. We have paid options too to make your shisha special — use the ice hose (+¥200) if you want your smoke to be icy. Wanna get drunk? Then adding alcohol (¥1,000) is another thing you can opt for. You can also add fresh fruits (starting from +¥300)! What’s the difference between the two sizes? The amount of the flavor differs, i.e. the amount of time it will last. Choose whichever you’d like! You can share one hookah with up to three people. Are you a solo-hookah smoker? We have good news for you! The regular size would be ¥900, and the large for ¥1,200. Again, feel free to bring in any alcohol or food you’d like! But just one favor — don’t bring in dishes with a strong smell, e.g. curry or Tonkotsu-Ramen. You’re going to make the other peeps hungry. Copyright© 2017 はちグラム(8g) All Right Reserved.